Establishing another band becomes easier when you’re launching from familiar musical ground. 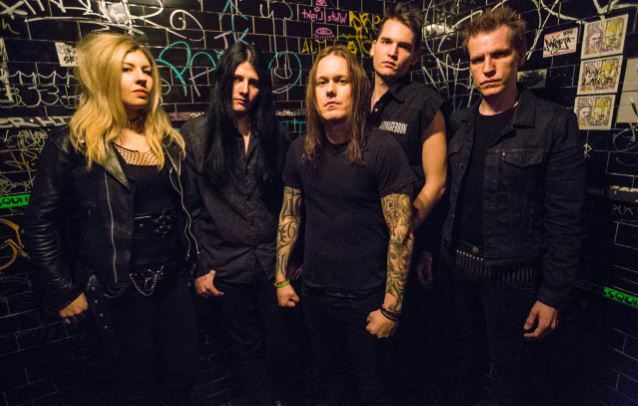 In the case of guitarist Christopher Amott, being a primary songwriter in the Swedish melodic death act Arch Enemy from its 1995 inception he watched the band soar to headlining status the world over. During initial down time between recording/touring endeavors, he would develop Armageddon and record three albums from 1997-2002, only to suspend activity as the workload and touring demands increased for Arch Enemy. Resurrecting Armageddon after permanently moving to the United States and giving it a new lease of life through fresh members, their fourth studio album Captivity and Devourment proves their lots of creative energy and stellar power oriented melodic death left in Christopher’s tank. He is one of those rare players who has a recognizable style and fuses professional chops and emotional textures – something that a lot of the new generation of axe shredders could take into account. Readying themselves for another round of tour dates across America, I fired off a series of questions to Christopher, who as the consummate professional responded in a quick fashion. Dead Rhetoric: In recent news about the band you are in search of a new growler/screamer on vocals as Matt Hallquist is stepping down due to personal reasons. Has this been a long time coming, and how quickly do you hope to fill the position to support your new album Captivity and Devourment? Christopher Amott: We had a feeling it was not going to work out with Matt, unfortunately. We wish him the best. He has some personal issues that prevent him from touring with this band. Thankfully we have now secured Antony Hämäläinen (ex-Nightrage) as our vocalist for the upcoming US dates in February. Dead Rhetoric: You’ve been conducting guitar clinics in Europe this month – what are these events like for you and what types of questions do the attendees throw at you regarding the guitar, techniques, or business related matters? Is there a particular format you like to follow? Amott: I enjoy them a lot actually, they usually run about 90 minutes in time or more, depending on how much the audience engages. I usually end up talking a lot and answering questions. I perform 7 full songs to backing tracks, it’s a selection of music from Arch Enemy, Armageddon and my solo material. In between those I have topics prepared that I go over. These are things like practicing, different playing techniques, songwriting, gear, theory etc. Also, I share some stories & things that I’ve learned throughout my career. Dead Rhetoric: It’s been 13 years since the last Armageddon album Three. Did the increased workload in Arch Enemy from 2002 until your 2012 departure necessitate the lengthy break for the band? And have you been compiling material for Captivity and Devourment during that interim or is most of the material very fresh and written within the last couple of years? Amott: Well of course Arch Enemy was a busy band during that time, and also I didn’t have the need to release any metal or death metal style material outside of Arch Enemy, since I was one of the main songwriters there. However after doing my two solo albums I had the urge to return to more intense music, and to focus more on guitar playing and arranging, rather than singing and writing lyrics. I wanted to write good, catchy metal, and I wanted to have a band where I could do less singing and focus more on riffing and soloing. I knew I wanted to make the best metal album I’ve ever done and was extremely motivated to write a great record without compromise. It took about 2 years of arranging and demoing to get it all together. Dead Rhetoric: I for one enjoy the fact that the new album seems to have a lot of different dynamic elements and arrangements – blending together your known penchant for melodic death metal and power metal, but maintaining a sense of groove and hook elements to develop distinct songs. Is this something you are conscious of throughout the process of songwriting to recording – and are there particular elements that are more challenging than others to get just right? Amott: Thank you! I did have some ideas going in, for example on the songs “Captivity & Devourment” and “Equalizer”, I wanted to write songs with many parts and a lot of changes to keep an intensity going throughout the track. Actually, I never listen to new or contemporary metal bands, ever. I don’t want to be influenced (by them). I stopped listening to new metal music in the 90’s and that’s probably why my songs sound the way they do. That’s my style, my influences. Honestly, some stuff that goes for metal today bores me and is somewhat foreign to me. Today I listen to pop music and anything that is a good song. Or I’m blasting the records I grew up with, Priest, Sabbath, Maiden, Slayer, Megadeth, Pantera etc. Dead Rhetoric: How do you rate each of the previous Armageddon albums now after reflection? What would you consider the highlights and are there any aspects you wish you could revise/change in retrospect? Amott: I would say that this album has the best elements of all three previous albums combined. I’m proud of all of them! Of course listening back there’s always going to be elements that seem slightly foreign 10+ years down the road… tastes and influences change. Sometimes I think, “Why did I do that? ?” But generally I view every album on its own terms, and a product of its time. Dead Rhetoric: How did the new members of Armageddon come into the fold? Are you finding things different now basing the band in the United States versus your Swedish start? Amott: Well, Sara (Claudius) I’ve known for years, she is a guitar player originally but offered to play bass in Armageddon. She writes the majority of the lyrics in Armageddon, and also contributes to the music. We wrote the album together. I met our guitar player Joey (Concepcion) through giving guitar lessons, he was a student of mine for a short period. Like me, he is a blues-based player and can improvise freely and that’s the most important thing for me in another guitarist. We speak the same language musically. He brought our singer Matt into the project, they are from the same area in Connecticut and have played shows locally together with their old bands. The hardest part was finding a drummer, we tried out three different players who didn’t fit before deciding to have a guy by the name of Nick Bunczk do the album as a session player. Finally I met Márton (Veress) in NYC, he is from Hungary and used to play in the classic Hungarian band Pokolgep. And as far as the US goes, I would say that since there are more musicians here, and there’s a bigger scene for every genre, it was easy to find members. At least that goes for New York City, where I currently reside. 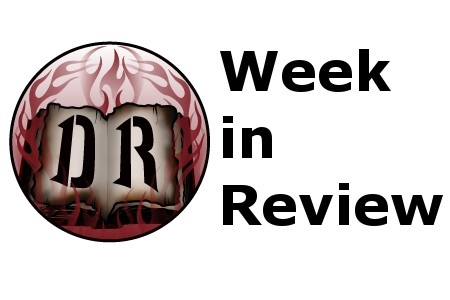 Dead Rhetoric: What have the recent Armageddon live shows been like – and do you feel like it’s more of a building block mentality because you obviously have a little bit of a following due to your Arch Enemy years, but again have to prove your worth to newcomers? Amott: We are excited to play and our shows have a raw energy. I enjoy playing to crowds both big and small. Of course I’m thinking about building the band and playing bigger shows, but you have to live in the moment and enjoy the present. Dead Rhetoric: You are signed to Listenable Records. How do you view the role of record labels in 2015 given the changing climate of digital music, lower record sales, and so much more product in the marketplace fighting for consumer attention? Amott: Listenable were one of the first labels to express interest in releasing the album. They seemed genuinely excited about the music and I knew we would be a top priority for them. That’s a great feeling for a band, to have a label like that to work with. But record labels seem less important than before as more and more aspects of promotion and distribution are in the hands of the artists now, and that’s fine by me. Dead Rhetoric: How would you describe your personality to the average person? And how is your relationship with Mike these days, considering you stepped down from Arch Enemy a couple of years ago (but filled in when needed on a recent tour)? Amott: I can be pretty dark at times, and I think that’s one of the reasons I was drawn to playing extreme metal. My relationship with Michael is great, we hang out whenever we can and jam and share song ideas. Dead Rhetoric: Can you tell us three albums that shaped your ideas and playing ability as a guitarist – and what would you say is the most memorable concert you’ve taken in purely from a fan perspective? Amott: Yngwie Malmsteen – Rising Force; Frank Marino – Juggernaut; Slayer – Reign in Blood. I can’t think of a concert that really stands out, I prefer enjoying music on my own. Dead Rhetoric: Are there any particular bucket list goals for you left to accomplish, either within the music world or outside of it? Amott: Music is my life, my work and my hobby. And especially my passion is writing and composing, and not only in the metal genre. My goal is always to reach as many people as possible with my music, so I will continue to create for as long as I can. I would like to write more for other artists or score a movie or a TV show or a computer game… something where I’m behind the scenes and not performing. I’d also like to collaborate more with other artists, I enjoy writing together with others. Dead Rhetoric: What are the long term plans for Armageddon over the next year or two? Would you like to get another album out quickly or would you rather take your time for the fifth Armageddon studio recording? And is there any possibility of another solo record or guest appearances scheduled soon? Amott: As far as Armageddon goes, it’s definitely not just a studio project. I expect to grow it into whatever it can be. We are actually already writing the second album (with this lineup), we will be recording it next year along with touring as much as we can. I am also working on a brand new project, but I won’t tell more than that… I want it to be a complete surprise.